The automobiles sold by The Beverly Hills Car Club combine all the elements of our exclusive address: these cars are the very last word in tasteful elegance, chic classiness, and impressive sophistication, with scrupulous attention paid to their functional integrity and stylish perfection. The vehicles sold by The Beverly Hills Car Club reflect the gamut of today's social and economic experience: there are those automobiles that are top-of-the-line unequalled perfection, in which case scrupulous attention will have been paid to the particular model's functional integrity and stylish perfection: any body-work defects, especially any rust discovered, will have been removed; any misfiring engine components will have been replaced; any snags connected to the interior fittings will have been rectified. However, The Beverly Hills Car Club also has a number of the kind of nuts-and-bolts 'restoration projects' adored by enthusiasts, their condition reflected in their cost. Whichever your choice, you are secure in the knowledge that at The Beverly Hills Car Club we love our cars. And we love our customers. 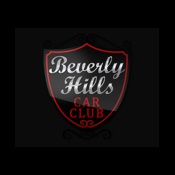 For all your automotive wants and desires, you need to come to The Beverly Hills Car Club. You will never make a happier car purchase.